A child being rescued from the scene of a building, which collapsed at Itafaji on the Lagos Island on Wednesday. 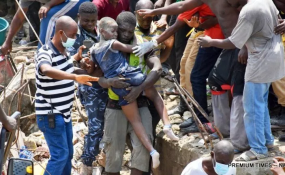 Lagos — Lagos metropolis witnessed another tragedy yesterday when a three-storey building located at Massey Street, opposite Oja, Ita Faaji, Lagos Island, collapsed at about 10am, killing 12 persons said to be school pupils, with many others still trapped in the rubbles of the collapsed building. It was, however, reported that 45 pupils were rescued from the wreckage of the building. LEADERSHIP gathered that an illegally run school was located in the building that suddenly caved in, killing some of the occupants. Witnesses said no fewer than 45 pupils had been rescued from the rubbles, but many of the pupils and other occupant were still trapped in the rubbles at the time of filing this report. A parent said to have five children in the school was seen crying, " I have not seen any of my five children in the school. I am finished." As rescue operations continued at the scene of the collapse, Lagos State governor, Mr Akinwunmi Ambode, visited the scene and commiserated with families of victims. Ambode, who got to the place at about 2:42pm, described the incident as unfortunate. He, however, appealed to residents to allow rescue operators the space to carry out their work without any hindrance so as to rescue more children trapped under the rubbles. "I want to commiserate with the families of those that lost their lives in this collapsed building. I want to quickly let Lagosians know that this is quite an unfortunate incident. All we are trying to do is to scale up this rescue operation. Our response units are already here; we are getting additional cranes to be able to go deeper than where we are now, to rescue more lives. "I just want to appeal to people that when we are doing this kind of rescue operation, yes, sympathisers will naturally come, but I want to appeal that they should give the rescue workers the chance to save more lives," he said. The governor noted that his deputy, Mrs Oluranti Adebule, had also visited the hospitals where some of the rescued victims had been taken to, just as he assured that the state government would immediately take over their treatment and foot their bills. "The deputy governor is in the hospital actually taking care of those that were rescued and taken to the hospital, especially the children. On the part of government, we would immediately take care of whatever it is that we can do, including the hospital bills. "All we are interested in now is to save more lives and also see how those that have been rescued are put in proper place and proper care," he said. Noting that he received information that about two floors of the building sank to the ground, the governor revealed that most of the buildings in the area had been marked for demolition, but that some property owners in the area defy such notices. He gave the assurance that, going forward, structurally defective buildings would be demolished. "The first observation is that this is an old building and it is only the Pent House and the other floors that we have been able to use to rescue people. "So far, from what I have been briefed, we have rescued about 25 people and some are already dead, but we were earlier informed that it was a school; the building is not technically a school, it is a residential building that was actually accommodating an illegal school, so to speak, on the second floor. "Like we have said, we have been carrying out a lot of integrity tests on the buildings in this neighbourhood and, as you can see, some of them have been marked for demolition but we get resistance from landlords. But we must continue to save lives and we would intensify our efforts to see that those that have failed our integrity test, we would ensure that they are quickly evacuated and we bring the structures down," he said. Ambode also pledged that a full scale investigation would be carried out immediately the rescue operations are concluded, vowing that those found culpable would be severely dealt with in accordance with the relevant laws. "This is unfortunate but we will investigate what has happened and also see the punishment for whoever are the culprits. That is the secondary level, but the most important thing right now is to save lives and I just appeal to people that they should give us the chance to save more lives," he said. The governor added that rescue operations would continue until all victims were rescued, noting that the General Officer Commanding 81 Division and the Brigade Commander were on ground to maintain peace and ensure smooth rescue operations. "That is what is important to us, and the more lives we save, the better for us," he said. Responding to a concern raised by a resident on the increase of illegal schools in the area, Governor Ambode said all schools that fall within that category would be closed down. President Muhammadu Buhari and the speaker of the House of Representatives, Yakubu Dogara, have expressed sadness over the collapsed building. According to a statement by his special adviser on media, Femi Adesina, the president sympathised with the parents and relations of the deceased, wishing them God's comfort. He also wished the injured speedy and complete recovery. The president also commiserated with the government and people of Lagos State, and pledged to offer assistance from the federal government as may be required by the state. "It touches one to lose precious lives in any kind of mishap, particularly those so young and tender. May God grant everyone affected by this sad incident fortitude and succour," the president said. He urged the Lagos State government to do all that is needful so that such tragic developments do not recur in future. On his part, Dogara said it was heart breaking that innocent souls would perish in such a dreadful manner and called for a thorough investigation into the unfortunate incident. He said, "This is one too many of these building collapses that usually claim the lives of innocent people. It is time for decisive actions to be taken against all those found culpable of breaching the building standards that end up in disasters. "The law-enforcement agencies and regulatory bodies must step up their game and put an end to the practice of cutting corners to increase gain. While this has not been established as the cause of this incident yet, past incidents have pointed to this as a serious factor." He extended his sympathies to the families of the deceased and prayed that their souls rest in peace.